My mom loves *五仁 moon cakes. I decided to bake her some. After all, the past years, I have never attempted on baked moon cakes as what I understand is that you need an oven with different top and bottom heat to attain that lovely even toned golden brown that a good moon cake should have. Getting together the ingredients is not that easy as I have to make a special trip down to town. The shop ran out of olive seed (榄仁). According to the man, the market retail price is S$100/kg now and it is out of stock! So I actually bought some pine nuts to substitute it. Since it is home made, I guess that perfection will never be able to achieved. I will trade quality over looks anytime. Will you? Here is my attempt on the 五仁月饼. I bring it along when I met up with DK this morning for some discussion over a project that I am embarking on. Her feedback is that it is good except that the pastry is a little dry. I think I will have to leave it for a few days to give a final verdict as baked moon cakes actually cannot be consumed freshly baked. It has to “rest” to give that 游水look. Initially I was worried about the uneven tone. I blamed it on my oven but after a few hours, the colour seems to look nicer (even though it is still not commercial standard) but I am happy with the presentation. I thank the invention of the plunger system mould. It sure makes the whole moon cake making process a breeze. Overall, this is relatively easy to put together. I think even beginners will have no problem. Stay tuned for snowskin version. Five kernel (五仁, wǔ rén)) : A filling consisting of 5 types of nuts and seeds, coarsely chopped, is held together with maltose. Put all dry ingredients into a big bowl and mixed well. Add in the seasoning and mixed again. Let it rest for 10 mins and round them into balls. (mine is 30g). Set aside. Preheat oven to 200 degree. Wrap fillings with dough. Easing the dough to close up on the fillings. Place on baking tray and spray lightly with water onto moon cakes. Remove moon cakes from oven and let it cool down for approx 2 mins before brushing with egg glaze. After brushing with egg glaze, continue baking at 175 deg for another 10 mins. or till golden in colour. 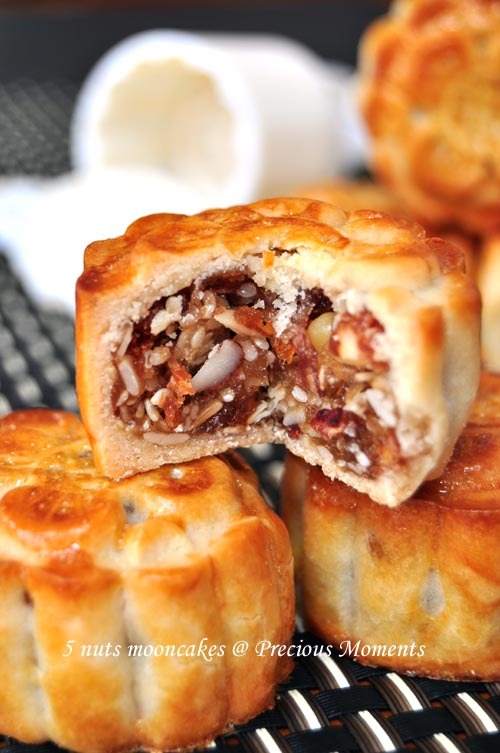 i like 五仁月饼 too, hopefully this year i am able to make this mooncake. Your have it so well..good job! Looking at your moon cake, reminds me of my late grandpa. He simply loved this wu ren moon cakes. Eating one whole cake all by himself is a norm thing. If only he is still around, I would love to make him some. Yours look so good!